The starting point for our educational work are the collections of the Karl May Museum. This not only involves educating the public on Karl May as an author and the Indian cultures of North America, but also inspiring imagination and creativity. Our museum is an ideal place for this. 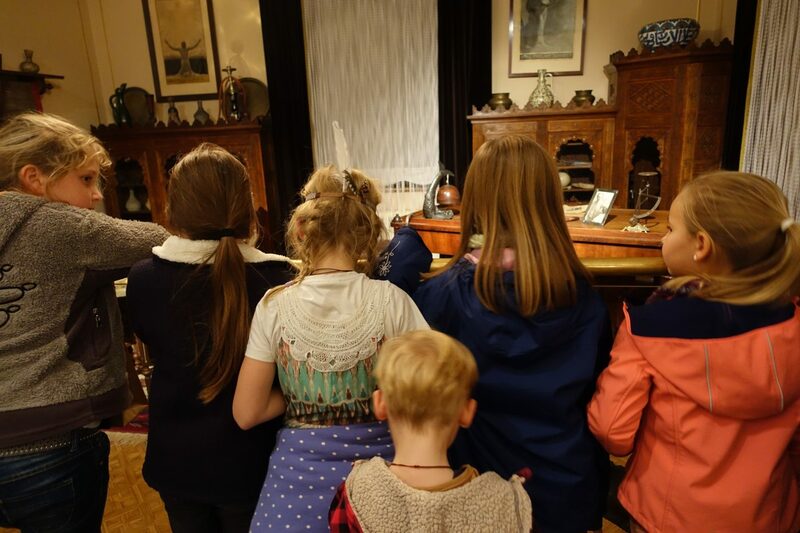 Most of these educational services consist of two parts: On a guided tour of the exhibitions, the children and young people dive into Karl May’s world of adventure and get to know the diversity of the Indian cultures of North America. The museum tour is combined with a design service for different age groups, which requires creative work and craft skills. For higher age groups, we can focus on specific topics in group work after a tour. Every one of you definitely has an image in their mind when they think of North American Indians and their homeland. And you certainly associate two or three things immediately with Indians: teepees, canoes and totem pole. All three were important to the Indians. On our museum grounds, you can find these three things alongside many other Indian artefacts. During your guided tour, you will get an interesting insight in the lives of the Indians. This will focus on the teepee, canoe and totem pole. Then everyone can create their own object from Indian culture, and then take it home with them. Then your whole group puts together an Indian area from the components created. Our museum consists of two permanent exhibitions, “North American Indians” in Villa Bärenfett and “Karl May – Life and Work” in Villa Shatterhand. The museum visit is broken down into two parts – a guided tour and a creative part – with each part lasting one hour. The guided tour is made attractive and comprehensible for children, and involves the children interactively. As the handicrafts options in the creative part are suitable for younger age groups up to 4th class, we recommend the programme for these groups in particular. You think drums, dancing and Indians belong together? That’s right. But Indians had lots of other instruments. You can learn which those were and what role music played for the Indians during the tour of our museum. Of course, we not only look at drums, rattles and the Apache violin, but also many other objects that can tell us something about the lives of the Indians. Then you can make your own Indian rattle to fill your home with sound. We can’t wait to see what rattles you choose! Our museum consists of two permanent exhibitions, “North American Indians” in Villa Bärenfett and “Karl May – Life and Work” in Villa Shatterhand. The museum visit is broken down into two parts – a guided tour and a creative part – with each part lasting one hour. The guided tour is made attractive and comprehensible for children, and involves the children interactively. We recommend the hand rattle for younger school children, as it takes more highly developed fine motor skills to make the turtle rattle. Have you ever painted a picture with sand? Never? Then come to the museum, that’s just what you can do here. Before everyone can produce their own personal sand picture for home, you learn some interesting facts on the life and work of the man our museum is named after, Karl May, and also take a fascinating look at the lives of the Indians he wrote about. You don’t know what sand pictures are good for? During the guided tour, we will look closely at many details in our exhibits, including the meaning and uses of sand pictures. Let your creativity run free and design it however you want it. Our museum consists of two permanent exhibitions, “North American Indians” in Villa Bärenfett and “Karl May – Life and Work” in Villa Shatterhand. The museum visit is broken down into two parts – a guided tour and a creative part – with each part lasting one hour. The guided tour is made attractive and comprehensible for school children, and involves them interactively. Depending on the age group, the children can make the sand picture in different ways: There are various ready-made motifs for younger school children to choose from. Older school children can use templates or design their own motifs. I’m sure you have all had a nightmare before, and know how hard it is to fall asleep again afterwards. The Indians had dream catchers in their teepees in case that ever happened. You can see lots of everyday items the Indians had in our museum. You will learn about all of these things during the tour, so that you can understand the lives of the Indians better. Then you can create your own dream catcher to protect yourself against bad dreams in future. What will your own personal dream catcher for your room look like? Our museum consists of two permanent exhibitions, “North American Indians” in Villa Bärenfett and “Karl May – Life and Work” in Villa Shatterhand. The museum visit is broken down into two parts – a guided tour and a creative part – with each part lasting one hour. The guided tour is made attractive and comprehensible for school children, and involves them interactively. School children usually love to make the dream catcher, but it takes a certain level of fine motor skills. Who was Karl May and what did he have to do with the North American Indians? Why is there a museum about Indians in Radebeul? Explore the Karl May Museum and its exhibitions yourself. Work together in researcher groups, discover and collect knowledge and information on many interesting subjects related to Karl May and the Indians. 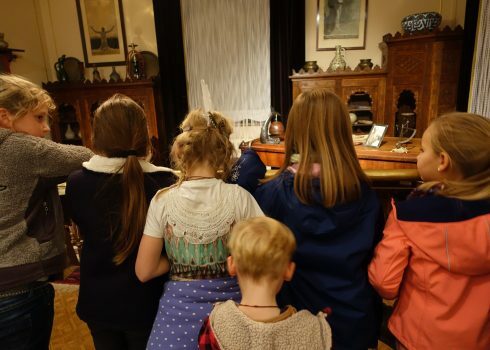 At the start of the event, the school children receive a brief introduction to the Karl May Museum and the two exhibition buildings. Then worksheets are handed out, which the school children are to complete independently, working in groups. The results will be assessed afterwards while walking around the various stations in the exhibition rooms. This gives participants an in-depth insight that can be expanded via questions and problems for the students. Guide to the Karl May Museum for Children (in German), available in our Museum Shop. The children can bring food with them or buy it from the snack bar in the summer months. Groups can stay in the museum and on the museum grounds longer than the educational programmes: Of course, additional services like the gold panning station, the playground or the interactive station for children can also be used.